Cup belonged to Barbara Ann Fields - b 8 May 1854 - daughter of Alexander and Mariah Mooring Fields. Wife of John Moses Mewborn. Sent by Lucy Whaley, a descendant. 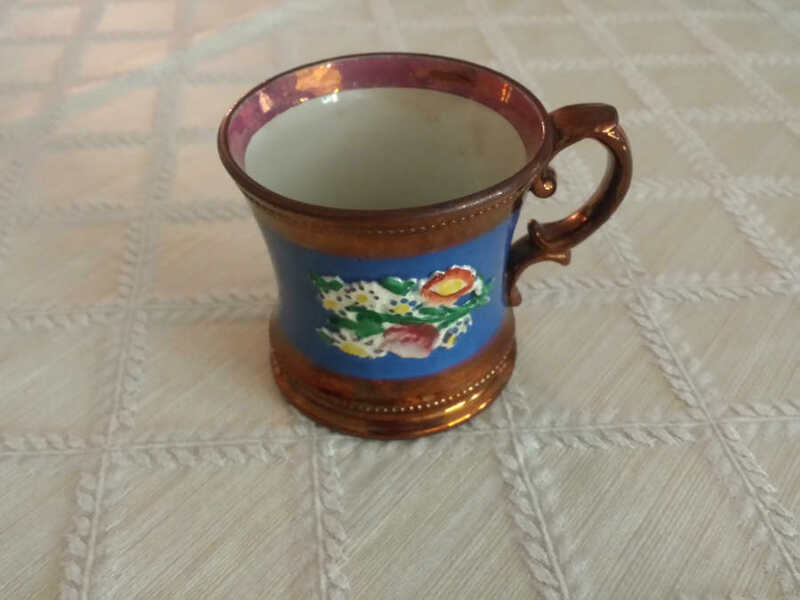 Lucy stated her grandmother took this cup to church every Sunday and attended Mewborn's Primitive Baptist Church in Jason. Most likely she did not attend that church prior to her marriage. Trish Worthington Cobb made the following comment regarding the cup - Nice piece of copper luster ware. Jack T. says he may be wrong, but probably 1850s. Possibly a shaving mug. Looks similar to English copper luster. Search on-line for English copper luster 1800s.